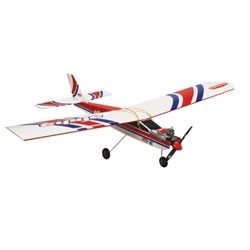 This Alpha 40 ARF Trainer is based on the same Alpha 40 RTF Trainer that has been used in flying clubs everywhere to introduce thousands to the fun of RC flight. It uses the same flat-bottom, high-wing design that provides self-righting flight characteristics and stable slow speed manners. To this proven platform it adds the option of powering it with a Power 25 brushless electric motor or .40-size glow engine, making it one of the most versatile trainer ARFs available.